A raunchy comedy with nuns. As with most raunchy comedies, if it is funny, other issues can be forgiven. The Little Hours is funny. Massetto (Dave Franco), a young servant fleeing from his master (Nick Offerman) whose wife he had an affair with, comes across Father Tommasso (John C. Reilly), who is drunk and has lost his cart full of goods into a small river. Massetto aids the drunken priest and Father Tommasso offers the boy a place to stay at his convent. Problem though. The nuns at this convent are not the regular version. They are violent, attacking the previous handyman for talking to them. So, to protect him, Father decided for Massetto to pretend to be a deaf mute. 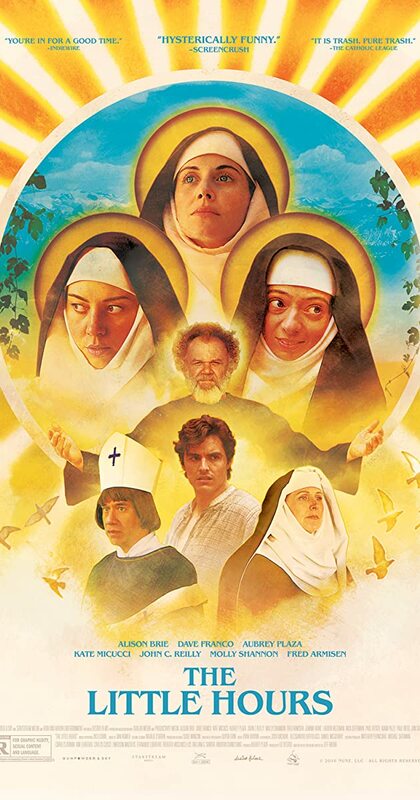 The three main nuns, Sister Alessandra (Alison Brie), Sister Fernanda (Aubrey Plaza) and Sister Ginerva (Kate Micucci), meet Massetto and he sends their libidos into the atmosphere. This film is a satire on the church and the manner of male-female sexual relationships. It does not take the group long to be succumbing to their lust. Because it is a satire, these characters are not remarkably deep, focusing mostly on the archetype more than anything else. Once heading down the path of revelry, the nuns cannot be stopped. There is a scene with witches that is extremely funny and downright shocking. The actresses are funny in their naughty behavior and Dave Franco is imminently likable as the young Massetto who feels like he is being taken advantage of by all of the characters in the film. John C. Reilly and Molly Shannon (who plays the head nun Sister Marea) are very good in the movie, and they have some very sweet scenes together. Their relationship seems to come out nowhere, though. Fred Armisen comes in later in the film as Bishop Bartolomeo and delivers some funny scenes. The nuns though go way over the top. I will tell you that the humor is not “rolling on the floor” laughter, but there are consistent laughs throughout. There may be some who are offended by the use of the church setting to tell this raunchy satire, but it makes sense when you are dealing with isolated, horny individuals. It was a decent film.